Yesterday Baby G went to Kidslink for the 2nd time as his cough was getting much worse. This time, Doctor Tan said his lungs had phlegm in them as compared to Monday when it was all cleared. She said he's probably got mild bronchitis and needs to go on the Nebulizer. The Neb is kinda like breathing in oxygen from the oxygen tank. 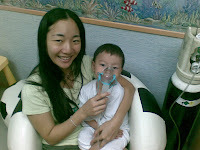 The nurse inserted the medication into a tube near the oxygen mask and started the machine. It was pretty noisy and mist was generated. Initially Baby G was scared of the mask itself, but soon, he actually told us "nice". So we took it that he enjoyed it. He had to be on the Neb for about 5minutes or til the medication runs out. For the first few minutes, he quietly sat there, breathing in the mist, then towards the end, he started to get bored and kept squirming out of my arms. Luckily when the nurse came in, she told us that only left about 10 seconds more... so I counted 1 to 10 slowly and Baby G sat there listening to me count. Finally it was over. Can see the effect it had on him. His breathing seemed much more smoother and less congested. However, the amount of medication that he now needs to take has increased. The poor boy. His appetite has also reduced. He can't even finish his usual 210ml of milk that he normally gulps down in record time. He's definitely lost some weight and he looks much thinner. Today, in the morning, his cough seemed to be much much worse, but later part in the afternoon, it seemed to reduce and his mood improved. He was running around the house, playing with his toys and driving his car. He finally fell asleep after drinking just half of his usual milk intake. We really hope Baby G will recover soon although the Doc mentioned that it usually takes a week to fully recover. The next review is tomorrow. Hope Doc brings us good news.